If you are looking for a mid-sized sedan that has a lot of acceleration and power, the Dodge Charger found at Hunt Chrysler Dodge Jeep Ram Fiat might be the right vehicle for you. The Dodge Charger has plenty of room for five passengers, and it is a reliable vehicle. The engineers at Dodge have designed the Charger with important technological features. 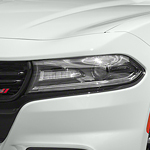 One important technological feature found on the Dodge Charger is the Keyless Enter 'N Go system. This system allows you to open the locked car as long is the key fob is in on your person. To start the car, just step on the brake and press the start button. The Dodge Charger is also equipped with driving mode selections. You select the desired driving mode, and the transmission and the engine will respond to the set mode. This feature allows you to be in complete control of your driving experience in the Charger.